Montserrat (/mɒntsəˈræt/) is a British Overseas Territory (BOT) in the Caribbean. The island in the Leeward Islands, which is part of the chain known as the Lesser Antilles, in the West Indies. 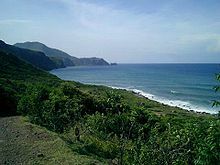 Montserrat measures approximately 16 km (10 mi) in length and 11 km (7 mi) in width, with approximately 40 km (25 mi) of coastline. Montserrat is nicknamed “The Emerald Isle of the Caribbean” both for its resemblance to coastal Ireland and for the Irish ancestry of many of its inhabitants. On 18 July 1995, the previously dormant Soufrière Hills volcano, in the southern part of the island, became active. Eruptions destroyed Montserrat’s Georgian era capital city of Plymouth. Between 1995 and 2000, two-thirds of the island’s population was forced to flee, primarily to the United Kingdom, leaving fewer than 1,200 people on the island as of 1997 (rising to nearly 5,000 by 2016). 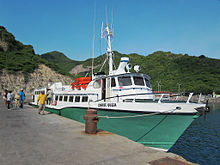 The volcanic activity continues, mostly affecting the vicinity of Plymouth, including its docking facilities, and the eastern side of the island around the former W. H. Bramble Airport, the remnants of which were buried by flows from volcanic activity on 11 February 2010. In 1493, Christopher Columbus named the island Santa María de Montserrate, after the Virgin of Montserrat in the Monastery of Montserrat, on Montserrat mountain, near Barcelona in Catalonia, Spain. “Montserrat” means “serrated mountain” in Catalan. Archaeological field work in 2012, in Montserrat’s Centre Hills indicated there was an Archaic (pre-Arawak) occupation between 4000 and 2500 BP ( 2000 to 500 BC ). Later coastal sites show the presence of the Saladoid culture ( until 550 AD ). A number of Irishmen settled in Montserrat in 1632. The preponderance of Irish in the first wave of European settlers led a leading legal scholar to remark that a “nice question” is whether the original settlers took with them the law of the Kingdom of Ireland insofar as it differed from the law of the Kingdom of England. The Irish being historical allies of the French, especially in their dislike of the English, invited the French to claim the island in 1666, although no troops were sent by France to maintain control. It was captured shortly afterwards by the English and English control of the island was confirmed under the Treaty of Breda the following year. Despite the seizing by force of the island by the English, the island’s legal status is that of a “colony acquired by settlement”. A neo-feudal colony developed amongst the “redlegs“. The colonists began to transport Sub-Saharan African slaves for labour, as was common to most Caribbean islands. The colonists built an economy based on the production of sugar, rum, arrowroot and sea island cotton, cultivated on large plantations manned by slave labour. By the late 18th century, numerous plantations had been developed on the island. Many Irish continued to be transported to the island, to work as indentured servants; some were exiled during the English Cromwellian conquest of Ireland. On 17 March 1768, slaves rebelled but failed to achieve freedom. The people of Montserrat celebrate St Patrick’s Day as a public holiday due to the slave revolt. Festivities held that week commemorate the culture of Montserrat in song, dance, food and traditional costumes. In 1782, during the American Revolutionary War, as America’s first ally, France captured Montserrat in their war of support of the Americans. The French, not intent on truly colonizing the island, then agreed to return the island to Great Britain under the 1783 Treaty of Paris. During the nineteenth century, falling sugar prices had an adverse effect on the island’s economy, as Brazil and other nations competed in the trade. 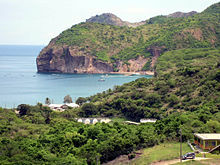 The 2011 estimate by the CIA indicates that 30% of the island’s land is classified as agricultural, 20% as arable, 25% as forest and the balance as “other”. Montserrat is an internally self-governing overseas territory of the United Kingdom. The United Nations Committee on Decolonization includes Montserrat on the United Nations list of Non-Self-Governing Territories. The island’s Chief of State is Queen Elizabeth II represented by an appointed Governor. Executive power is exercised by the government, whereas the Premier is the head of government. The Premier is appointed by the Governor from among the members of the Legislative Assembly which consists of nine elected members. The leader of the party with a majority of seats is usually the one who is appointed. Legislative power is vested in both the government and the Legislative Assembly. The Assembly also includes two ex officio members, the attorney general and financial secretary. In July 1995, Montserrat’s Soufrière Hills volcano, dormant for centuries, erupted and soon buried the island’s capital, Plymouth, in more than 12 metres (39 ft) of mud, destroyed its airport and docking facilities, and rendered the southern part of the island, now termed the exclusion zone, uninhabitable and not safe for travel. The southern part of the island was evacuated and visits are severely restricted. The exclusion zone also includes two sea areas adjacent to the land areas of most volcanic activity. For a number of years in the early 2000s, the volcano’s activity consisted mostly of infrequent ventings of ash into the uninhabited areas in the south. The ash falls occasionally extended into the northern and western parts of the island. In the most recent period of increased activity at the Soufrière Hills volcano, from November 2009 through February 2010, ash vented and there was a vulcanian explosion that sent pyroclastic flows down several sides of the mountain. Travel into parts of the exclusion zone is occasionally allowed, though only by a licence from the Royal Montserrat Police Force. Montserrat, like many isolated islands, is home to rare, endemic plant and animal species. Work undertaken by the Montserrat National Trust in collaboration with the Royal Botanic Gardens, Kew has centred on the conservation of pribby (Rondeletia buxifolia) in the Centre Hills region. Until 2006, this species was known only from one book about the vegetation of Montserrat. In 2006, conservationists also rescued several plants of the endangered Montserrat orchid (Epidendrum montserratense) from dead trees on the island and installed them in the security of the island’s botanic garden. Montserrat is also home to the critically endangered giant ditch frog (Leptodactylus fallax), known locally as the mountain chicken, found only in Montserrat and Dominica. The species has undergone catastrophic declines due to the amphibian disease Chytridiomycosis and the volcanic eruption in 1997. Experts from Durrell Wildlife Conservation Trust have been working with the Montserrat Department of Environment to conserve the frog in-situ in a project called “Saving the Mountain Chicken”, and an ex-situ captive breeding population has been set up in partnership with Durrell Wildlife Conservation Trust, Zoological Society of London, North of England Zoological Society, Parken Zoo and the Governments of Montserrat and Dominica. Releases from this programme have already taken place in a hope to increase the numbers of the frog and reduce extinction risk from Chytridiomycosis. From 1979 to 1989, Montserrat was home to a branch of George Martin‘s AIR Studios, making the island popular with musicians who often went there to record while taking advantage of the island’s climate and beautiful surroundings; the studio closed as a result of Hurricane Hugo. The island’s operating budget is largely supplied by the British government and administered through the Department for International Development (DFID) amounting to approximately £25 million per year. Additional amounts are secured through income and property taxes, licence and other fees as well as customs duties levied on imported goods. According to a United Nations estimate, the population as of April 2018 was 5,197 (for a density of 52 per square kilometer or 135 people per square mile), with just over 90% living in non-urban areas. In 2001, the CIA estimated the primary religion as Protestant (67.1%, including includes Anglican 21.8%, Methodist 17%, Pentecostal 14.1%, Seventh Day Adventist 10.5%, and Church of God 3.7%), with Roman Catholics constituting 11.6%, Rastafarian 1.4%, other 6.5%, none 2.6%, unspecified 10.8%. The population is predominantly, but not exclusively, of mixed African-Irish descent. It is not known with certainty how many African slaves and indentured Irish labourers were brought to the West Indies, though according to one estimate some 60,000 Irish were “Barbadosed” by Oliver Cromwell, some of whom would have arrived in Montserrat. Education in Montserrat is compulsory for children between the ages of 5 and 14, and free up to the age of 17. 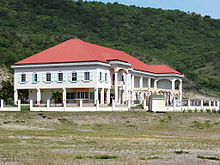 The only secondary school (pre-16 years of age) on the island is the Montserrat Secondary School (MSS) in Salem. Montserrat Community College (MCC) is a community college (post-16 and tertiary educational institution) in Salem. The University of the West Indies maintains its Montserrat Open Campus. University of Science, Arts and Technology is a private medical school in . After the volcanic eruptions of 1995 through 1997, and until his death in 2016, George Martin raised funds to help the victims and families on the island. The first event was a star-studded event at London’s Royal Albert Hall in September 1997 (Music for Montserrat) featuring many artists who had previously recorded on the island including Paul McCartney, Mark Knopfler, Elton John, Sting, Phil Collins, Eric Clapton and Midge Ure. All the proceeds from the show went towards short-term relief for the islanders. Martin’s second major initiative was to release five hundred limited edition lithographs of his score for the Beatles song “Yesterday“. Complete with mistakes and tea stains, the lithographs are numbered and signed by Paul McCartney and Martin. The lithograph sale raised more than US$1.4 million which helped fund the building of a new cultural and community centre for Montserrat and provided a much needed focal point to help the re-generation of the island. Many albums of note were recorded at AIR Studios, including Dire Straits‘ Brothers in Arms; Duran Duran‘s Seven and the Ragged Tiger, the Police‘s Synchronicity and Ghost in the Machine (the video for “Every Little Thing She Does Is Magic” was filmed in Montserrat however, the song was the only one on Ghost in the Machine not recorded there), and Jimmy Buffett‘s Volcano (named for Soufrière Hills). After sustaining severe damage from Hurricane Hugo in 1989, the studio is now a ruin. Ian Anderson (of Jethro Tull) recorded the song “Montserrat” on The Secret Language of Birds in tribute to the volcanic difficulties and feeling among residents of being abandoned by the UK government. Notable shows include the Morning Show with Basil Chambers and Rose Willock’s Cultural Show. Montserrat’s national dish is goat water, a thick goat meat stew served with crusty bread rolls. Montserrat cuisine resembles the general British and Caribbean cuisines, as it is situated in the Caribbean zone and it is a British territory. The cuisine includes a wide range of light meats, like fish, seafood and chicken, which are mostly grilled or roasted. Being a fusion of numerous cultures, such as Spanish, French, African, Indian and Amerindian, the Caribbean cuisine is unique and complex. More sophisticated meals include the Montserrat jerk shrimp, with rum, cinnamon bananas and cranberry. In other more rural areas, people prefer to eat homemade food, like the traditional mahi mahi and local breads. Map of Montserrat’s parishes: Saint Peter is top, Saint Georges centre and Saint Anthony bottom. The square marks Plymouth, the abandoned capital. Little Bay, the site of the new capital. The project was funded by the UK’s Department for International Development. Alphonsus “Arrow” Cassell, musician known for his soca song “Hot Hot Hot“. ^ “UN Data”. 2014. Retrieved 8 January 2017. ^ “The Caribbean Irish: the other Emerald Isle”. The Irish Times. 16 April 2016. Retrieved 9 January 2018. ^ “► VIDEO: Montserrat, the Emerald Isle of the Caribbean”. www.irishtimes.com. Retrieved 9 January 2018. ^ a b “Montserrat Volcano Observatory”. mvo.ms. Retrieved 2 October 2006. ^ a b c d Schuessler, Ryan (14 February 2016). “20 years after Montserrat volcano eruption, many still in shelter housing”. Al Jazeera America. Retrieved 23 November 2016. Montserrat’s population has grown to nearly 5,000 people since the eruption — mostly due to an influx of immigrants from other Caribbean nations. ^ Bachelor, Blane (20 February 2014). “Montserrat: a modern-day Pompeii in the Caribbean”. Fox News. ^ Pilley, Kevin (29 February 2016). “Bar/fly: Caribbean island of Montserrat”. The New Zealand Herald. ^ Handy, Gemma (16 August 2015). “Montserrat: Living with a volcano”. BBC News. Retrieved 8 July 2017. ^ Cherry, John F.; Ryzewski, Krysta; Leppard, Thomas P. & Bocancea, Emanuela (September 2012). “The earliest phase of settlement in the eastern Caribbean: new evidence from Montserrat”. Antiquity. 86 (333). Retrieved 25 August 2013. ^ Reid, Basil A. (2009). Myths and Realities of Caribbean History. University of Alabama Press. p. 21. ISBN 0817355340. However, archaeological investigations of the very large site of Trants in Montserrat … [suggest that Trants was] one of the largest Saladoid sites in the Caribbean. ^ Bergreen, Laurence (2011). Columbus: The Four Voyages. Viking. p. 140. ISBN 9780670023011. At daybreak on November 10, Columbus and his fleet departed from Guadeloupe, sailing northwest along the coast to the island of Montserrat. The handful of Indians aboard his ship explained that the island had been ravaged by the Caribs, who had ‘eaten all its inhabitants’. ^ Akenson, Donald H. (1997). “Ireland’s neo-Feudal Empire, 1630–1650”. If the Irish ran the world: Montserrat, 1630–1730. McGill-Queen’s University Press. pp. 12–57, 273. ISBN 978-0-7735-1686-1. ^ “Culture of Montserrat – history, people, clothing, beliefs, food, customs, family, social, marriage”. everyculture.com. Retrieved 8 July 2017. ^ O’Shaughnessy, A. J. (2006). “Caribbean”. In Boatner, III, M. M. Landmarks of the American Revolution: Library of Military History (2nd ed.). Detroit, MI: Charles Scribner’s Sons. p. 33. ISBN 9780684314730 – via Gale Virtual Reference. ^ Rodgers, Nini (November 2007). “The Irish in the Caribbean 1641-1837: An Overview”. Irish Migration Studies in Latin America. 5 (3): 145–156. ^ a b c Wells, John C. (1980). “The brogue that isn’t”. Journal of the International Phonetic Association. 10: 74–79. doi:10.1017/s0025100300002115. Retrieved 29 April 2017. ^ “Slavery Abolition Act 1833; Section XII”. 28 August 1833. Retrieved 23 May 2016. ^ Finkelman, Paul; Calder Miller, Joseph, eds. (1998). “Caribbean Region: English Colonies”. Macmillan Encyclopedia of World Slavery. Macmillan Reference USA – via GALE World History in Context. ^ Finkleman, Paul; Calder Miller, Joseph, eds. (1998). “Plantations: Brazil”. Macmillan Encyclopedia of World Slavery. Macmillan Reference USA – via GALE World History in Context. ^ “The Montserrat Connection”. sturgefamily.com. Archived from the original on 4 January 2017. Retrieved 8 July 2017. ^ “Montserrat”. Commonwealth Secretariat. Archived from the original on 8 July 2011. Retrieved 30 January 2007. ^ “Sir George Martin CBE (1926 – 2016)”. George Martin Music. 2017. ^ Rico, prepared by Puerto; al. ], the Virgin Islands: Joseph H. Golden … [et al. ]; South Carolina: Earl J. Baker … [et al. ]; for Committee on Natural Disasters … [et (1994). Hurricane Hugo : Puerto Rico, the U.S. Virgin Islands, and South Carolina, September 17-22, 1989. Washington, D.C.: National Academy Press. ISBN 978-0-309-04475-2. ^ “Postcode guide pamphlet” (PDF). www.gov.ms. Retrieved 1 August 2018. ^ “Montserrat (British Overseas Territory) travel advice”. Travel & living abroad. Foreign and Commonwealth Office. 19 December 2012. Retrieved 31 December 2012. ^ “Types of British nationality: British overseas territories citizen”. British Government. Retrieved 8 July 2017. ^ Johnson, Nick (22 October 2010). “The ‘Montserrat pribby’ (part one)”. kew.org. Archived from the original on 22 February 2014. Retrieved 30 November 2010. ^ “Saving the Mountain Chicken:A Long-Term Recovery Strategy for the Critically Endangered mountain chicken 2014-2034” (PDF). ^ “Montserrat oriole photo – Icterus oberi – G55454”. Arkive. Archived from the original on 30 November 2016. Retrieved 8 July 2017. ^ “Icterus oberi (Montserrat Oriole)”. The IUCN Red List of Endangered Species. Retrieved 8 July 2017. ^ “Diploglossus montisserrati (Montserrat Galliwasp)”. The IUCN Red List of Endangered Species. Retrieved 8 July 2017. ^ “Montserrat galliwasp videos, photos and facts – Diploglossus montisserrati”. Arkive. Archived from the original on 3 February 2017. Retrieved 8 July 2017. ^ a b Young, Richard P., ed. (2008). “A biodiversity assessment of the Centre Hills, Montserrat” (PDF). Durrell Wildlife Conservation Trust. Durrell Conservation Monograph No. 1. ^ “Bats”. Sustainable Ecosystems Institute. Archived from the original on 6 October 2014. ^ Pedersen, Scott C.; Kwiecinski, Gary G.; Larsen, Peter A.; Morton, Matthew N.; Adams, Rick A.; Genoways, Hugh H. & Swier, Vicki J. (1 January 2009). “Bats of Montserrat: Population Fluctuation and Response to Hurricanes and Volcanoes, 1978–2005”. ResearchGate. Retrieved 31 July 2011. ^ “Montserrat tarantulas hatch in ‘world first‘“. Chester Zoo. 12 August 2016. ^ a b c d “AIR Montserrat”. AIR Studios. Archived from the original on 18 October 2014. Retrieved 5 January 2013. ^ Richter, Alexander (2 September 2016). “Well pad ready for drilling of third geothermal well in Montserrat”. Think Geoenergy. ^ Handy, Gemma (8 November 2015). “Does Montserrat’s volcano hold the key to its future?”. BBC News Online. ^ “Census 2011 At a Glance” (PDF). Government of Montserrat. Statistics Department, Montserrat. 2011. Retrieved 23 November 2016. ^ McGinn, Brian. “How Irish is Montserrat? (The Black Irish)”. RootsWeb.com. ^ “Barbadosed: Africans and Irish in Barbados”. Tangled Roots. Archived from the original on 8 December 2014. ^ “Territories and Non-Independent Countries”. 2001 Findings on the Worst Forms of Child Labor. Bureau of International Labor Affairs, US Department of Labor. 2002. Archived from the original on 28 March 2005. ^ “The Open Campus in Montserrat.” University of the West Indies Open Campus. Retrieved on November 24, 2017. ^ AlMirSoft. “Yacht registration, training and certification of yachtsmen”. Montserrat Yachting Association. Retrieved 23 September 2016. ^ “Commonwealth Games Countries: Montserrat”. Commonwealth Games Federation. Archived from the original on 26 June 2014. Retrieved 24 July 2014. ^ “Montserrat Volcanos”. Montserrat Amateur Basketball Association. Retrieved 8 July 2017. ^ “Village basketball league makes a comeback”. The Montserrat Reporter. 11 July 2012. Retrieved 8 July 2017. ^ Cassell, Warren (18 July 2015). “Montserrat 2015 basketball Championship game Salem Jammers vs. Lookout Shooters”. YouTube. Retrieved 8 July 2017. ^ “Late Show Wins It For Pakistan In Abu Dhabi”. CricketWorld.com. 12 November 2008. ^ “Other Matches played by Montserrat”. CricketArchive. Retrieved 12 October 2012. ^ “Twenty20 Matches played by Montserrat”. CricketArchive. Retrieved 7 October 2012. ^ “Island of Montserrat”. Foreign and Commonwealth Office. Archived from the original on 1 July 2012. Retrieved 13 October 2012. ^ Kowalski, Jeff (11 September 2009). “Central America and Caribbean: Monserrat”. Retrieved 26 October 2009. ^ Wittebol, Hans. “The Parishes of Montserrat”. Statoids. Retrieved 26 October 2009. ^ “Little Bay Development”. DFID. 2010. Archived from the original on 25 April 2013. ^ Mott, Nicola (17 February 2006). “Stamp of approval!”. Lancashire Telegraph. Blackburn, Lancashire, England. Archived from the original on 30 November 2016. Retrieved 4 December 2016. “Montserrat”. The World Factbook. Central Intelligence Agency.